An aerial view of Tarawa, the capital of Kiribati, at high tide. The island lies only a couple of metres above sea level, and at high tide almost disappears into the ocean. More than half of Kiribati’s 100,000 people live in South Tarawa in an area of just over 10 km2, giving it a population density comparable to London. The tide comes in amongst the village of Tebikenikoora. 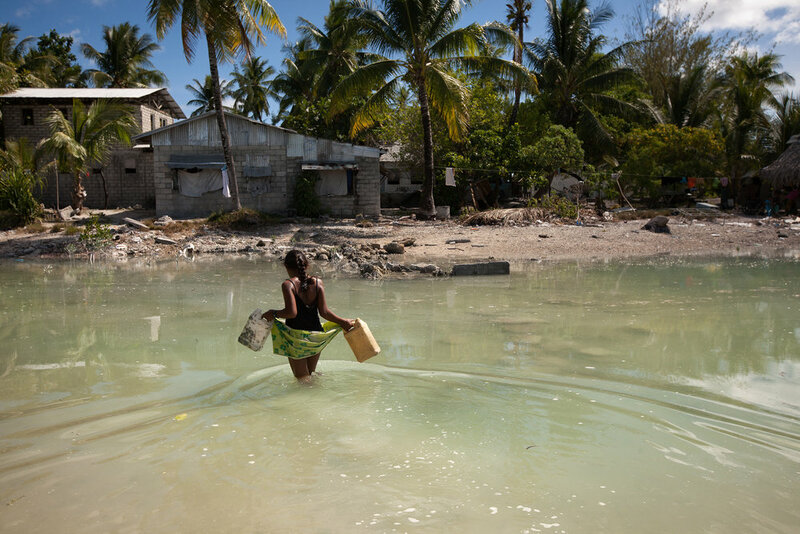 Small islands nations such as Kiribati and the Marshall Islands are widely accepted to be under threat from sea level rise, with some people, such as the president of Kiribati Anote Tong, saying the islands will disappear under the waves within 30 years. At sunset in South Tarawa, a boy looks across at a palm tree killed by the sea. In a few days, the moon will be full, bringing the highest tide in three months and the chance of another inundation by the sea. A young girl crosses the lagoon at high tide to get some water for her family who live on a thin strip of sand that gets cut off from the main island every high tide. A boy swims in the lagoon next to his house in Temwaiku that is heavily polluted with rubbish brought in by the tide each day. Children play with an old monitor that has washed up on the shore at Red Beach in South Tarawa. Every day, the hide tide brings in all manner of rubbish. With virtually no hard (or soft) waste management in Tarawa, the island suffers from a serious pollution problem. 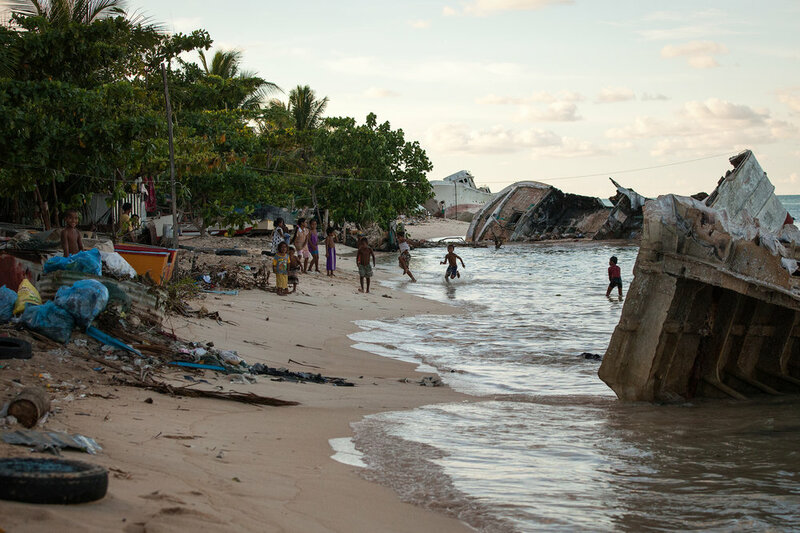 A boat washed ashore on Red Beach during a storm in 2013 now serves as play equipment for the local Betio kids. Betio is the most crowded and densely populated area in South Tarawa. On the lagoon side, boat hulls lie rotting where they washed ashore during storms a few years earlier. Every day, the tide brings in more garbage that washes up around people’s huts. Sometimes they bury the rubbish in the sand, but the tide washes the sand away the next day and the rubbish remains. Children play on old Japanese guns in Betio. The rusting 8-inch guns are left over from the Japanese occupation of Kiribati, ending in the three day Battle of Tarawa which claimed more than 6,000 lives on the tiny island. Young men spot schools of fish from a bridge near Betio in Tarawa. 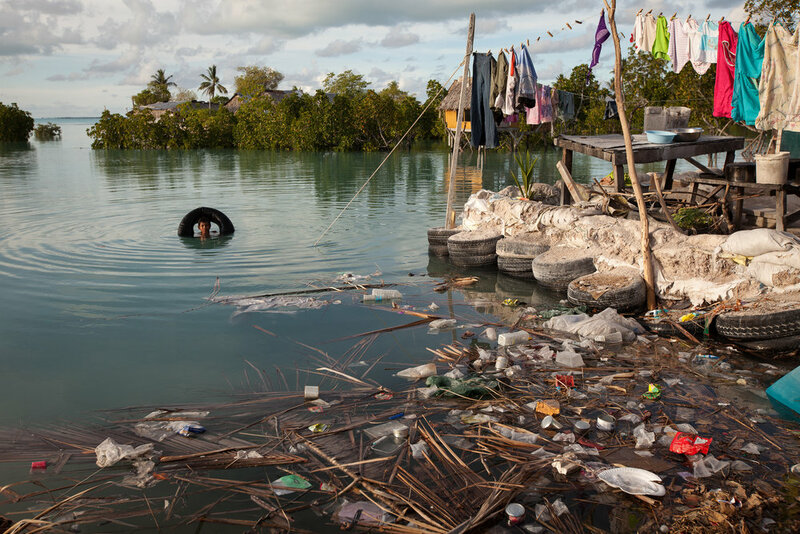 Fishing and the ocean are intrinsic to the way of life of young men in Kiribati. The young men come back to shore on the lagoon side with their catch. Despite firm warnings to travellers not to even wade in the lagoon due to pollution and open defecation, the locals eat the fish from here everyday. A young boy hangs off a bridge above the water rushing out below. Kiribati is focused on ensuring the youth acquire adequate skills and education to enable them to be able migrate away from their homeland ‘with dignity’ as the ocean continues to rise, making life in their country untenable. 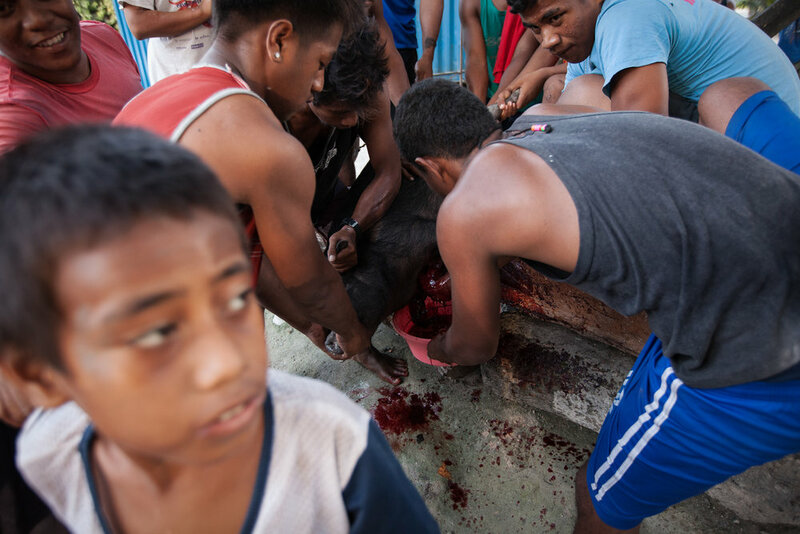 The first birthday of a son in Kiribati is an important event in their culture, often involving a big party in the village and the slaughtering of a pig. If President Tong is right and his islands become unlivable within a matter of decades, the young generation may well be the last to have a true sense of the I-Kiribati culture. Katewea Atanimatang from Bikenibeu, South Tarawa, looks after her one-year-old baby who is in hospital suffering severe dehydration and malnutrition. In Tarawa, the water is undrinkable and must be boiled, sometimes multiple times. Sicknesses from drinking bad water hits young children hardest, and last September more than 2,500 children under the age of five contracted rotavirus, with more than 20 of them dying. Former ambulance driver Ueatu Teaoti, a diabetic, sits in hospital having recently had his right (and driving) foot amputated above the ankle. One in four i-Kiribati has diagnosed diabetes, with many more living undiagnosed, making effective management very difficult. 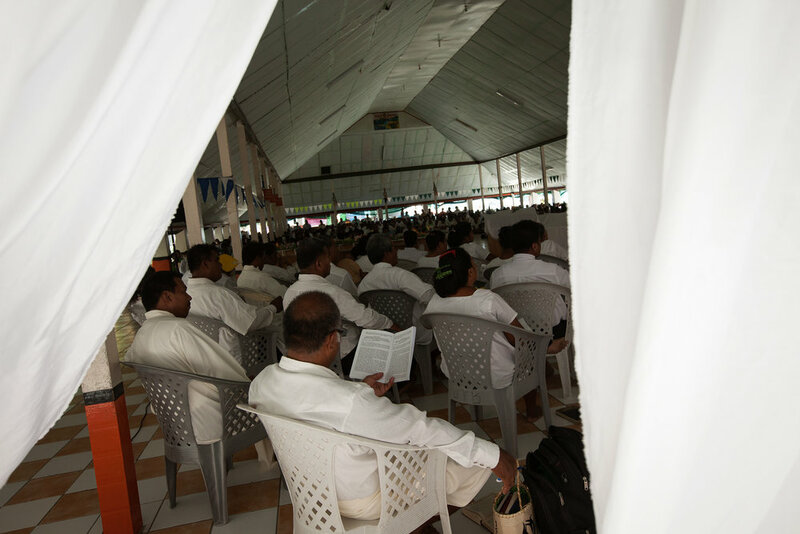 The choir of an Anglican church in Banraeaba, South Tarawa awaits their next hymn. 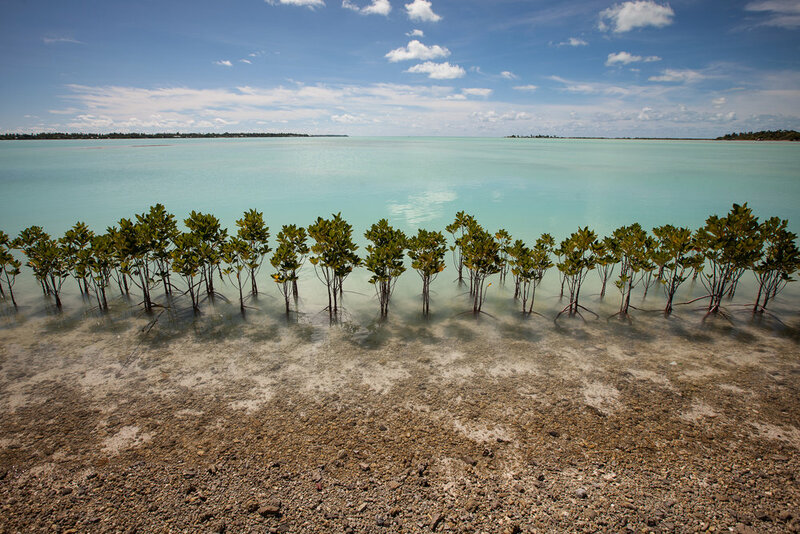 Kiribati is overwhelmingly religious, and the varying religions can have very different attitudes towards the potential impacts of climate change. Some accept the science and work with the community in education about the issue and help with preventative measures, however others deny that God would let their islands disappear. Lirok Joash, 89, is the oldest living Bikinian. Currently living on the tiny island of Ejit just off Majuro, she has been relocated multiple times already over her life because of nuclear radiation, and may well live to be relocated again, this time due to climate change. The graves of four babies who died as a result of complications due to radiation poisoning lie near the water’s edge in Ejit. The Bikinians see the issue of climate change in a similar light to that of the nuclear testing conducted in the 1950s. They believe that the fault lies with the western world, yet they are the people who pay most dearly for it. Coral reefs are vital barriers for the people of the atolls. In late 2014 a massive bleaching event struck the Marshall Islands and Kiribati. At Arno atoll in the Marshalls, this has resulted in mass coral deaths with much of the reef killed within a few weeks. The beach in Ajeltake, Majuro has visibly washed away in recent times to reveal the rock shelf below. As the beaches wash away more and more, the ocean encroaches further inland, killing palm trees, crops and other vegetation. Harvesting copra, the dried meat of coconuts, is the only source of income for many of the people living in the outer islands like Arno. In the northern atolls especially, copra has been severely affected by drought and the 2014 harvest was significantly lower than normal. This graveyard in Uliga falls further down into the sea as each storm causes further erosion. Jondrick Joash, 54, and her granddaughters Nola and Judy live in their half demolished house in Utidrikan, Majuro. The front rooms and kitchen were washed away by waves in February 2014, leaving just the front door, one tiny bedroom and a narrow strip of concrete that falls away to the eroded shore below. Eleven people live in the cramped ruin. 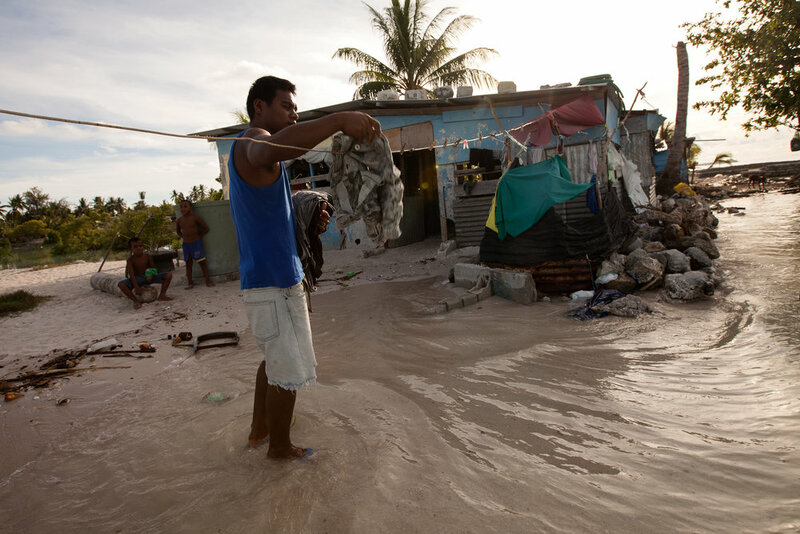 Tokeman Tekaakau brings in his washing as the waves lap around his ankles next to his house in Golden Beach. Tokeman said there used to be three more houses in front of his that had to be pulled down and relocated because the ocean continuously eroded the land away from under them. A young boy walks in front of a power box in Golden Beach as the tide fills in toward the wires. Last year a nearby box exploded when the water made contact with the wires. A worker removes equipment away from the incoming tide. The maintenance to this piece of road is interrupted every day with the high tide as the water comes up over the site. Sandbags pile up on the Betio causeway. There is only one road going from one end of Tarawa to the other, making it a crucial piece of infrastructure. The thin causeways linking bits of land together are particularly vulnerable to storm surges and waves, and require regular maintenance. Mangrove plantations are one of the methods used in the attempt to protect the land from the ocean. Their extensive root systems help build up sand and act as a buffer against storm surges. Iaonnatu Tikabenca, 26, and his cousin Aroua Kuratake, 8, fill bags with sand from the lagoon side of South Tarawa that will be used by their uncle to build a seawall on the ocean side of the atoll. A young boy scoops water out of the graves in Demon Town, Majuro. Many graves in this cemetery have been relocated further inland after washed into the sea during storms that coincided with a high tide in 2013. But after only being moved around 10 metres inland, the sea is already threatening to take these graves too. 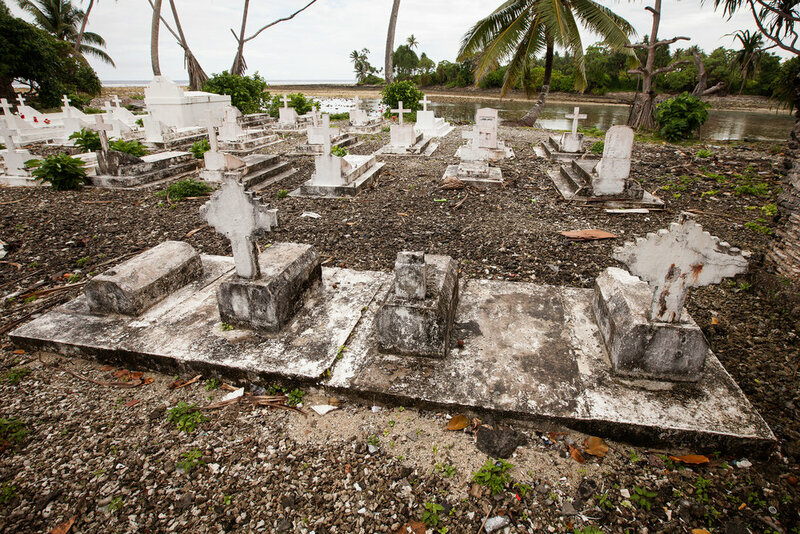 Cemeteries like this are scattered about the island of Majuro. With such a small area of land to a relatively high population, there are only so many places to bury the dead, and many graves have been washed into the ocean as the seas rise. 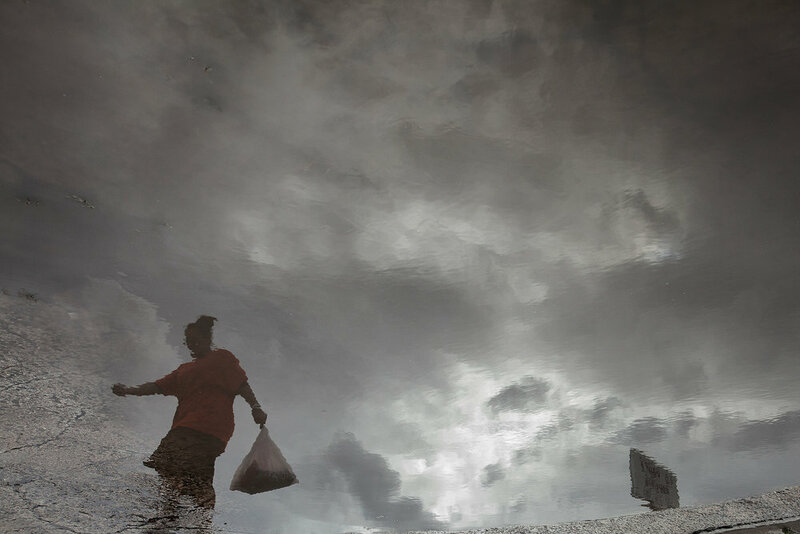 A shopper avoids the deep puddles during a storm on Majuro. Vast areas of Majuro are regularly subjected to flooding, whether it be from rain or the vastly more destructive ocean inundations. Tired from loading sandbags, a young man takes a nap between rain fronts. Some Marshallese houses have sandbags ready at both the front and back doors, to use depending on which side the water will come in from. 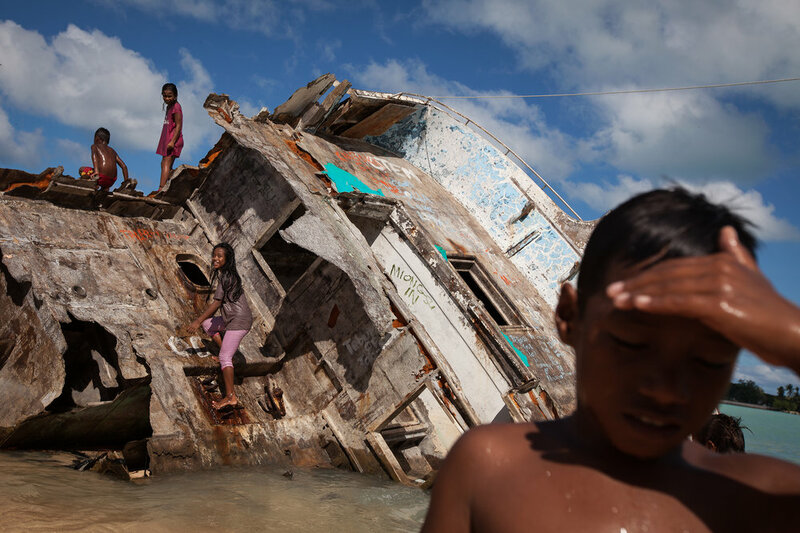 Young boys play basketball in Majuro after a storm. Basketball is the most popular sport in the Marshall Islands, and many children want to grow up and play in the United States. Marshallese are free to live and work in the US under a Compact of Free Association, making that the most likely destination should they have to leave their islands. As the tide comes in and the sun sets, a young boy gets in one final jump from a bridge in Tarawa. 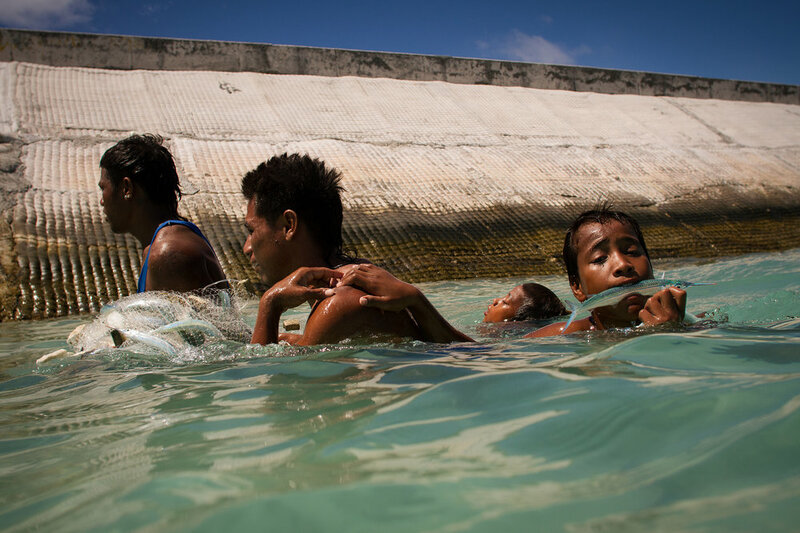 Without a similar Compact to ensure free passage to another country, the Kiribati people have no idea where they would end up should their country become unliveable in the coming years. With global temperatures still increasing and sea level rise continuing to accelerate, the future of these atolls hangs in the balance. Both countries will be sending large envoys to the UN climate change summit in Paris at the end of 2015, and will be loudly making their case to hold the world to a 2 degree rise in temperature in the hope that will be enough to save their countries.